Visit the surf mecca known as the North Shore. Begin your day by learning about Oahu’s rich history and sites as your professional tour guide takes you from the busy streets of Waikiki to the North Shore where you’ll feel like you’ve arrived on a tropical island in the South Pacific. From big wave surfing beaches like Banzai Pipeline and Sunset this tour really does visit the best attractions on North Shore including a visit to Historic Haleiwa Town. Pickups at all Waikiki locations and at Kahala Resort. 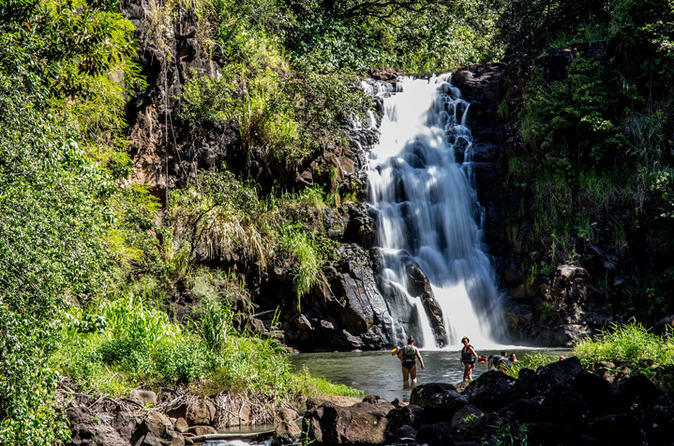 There’s really no better way to spend your day on Oahu than by visiting the laid back countryside also known as the North Shore. Begin your morning by learning about Oahu’s rich history and sites as your professional tour guide takes you from the busy streets of Waikiki to the North Shore where you’ll feel like you’ve arrived on another island. From big wave surfing beaches like Banzai Pipeline and Sunset this tour really does visit the best attractions on North Shore including a visit to Historic Haleiwa Town.